This program was conceived in January 2005 and with the help of Board Members, friends and Central Office Staff, the program was finally completed in October 2006. We wanted a way for our ACFA family to be able to share stories and memories of their special feline friends after they have gone to the Rainbow Bridge. Now, there is a way, right within our ACFA house, to pay tribute to the memory of that special cat, either personally or for the cat of a friend or loved one. By expressing your love through a memorial contribution to ACFA, you can help ensure that your fur friend is remembered, that human friends will know that your special kitty has gone to the Rainbow Bridge and to help ACFA do what it does in the best way possible. Help keep the memory of a special cat alive by supporting ACFA. Whatever the circumstances, the death of a feline companion can be a very traumatic experience — one filled with grief and sometimes with feelings of guilt. This time of loss is a vulnerable time, and a time when a friend's caring and understanding is especially meaningful and comforting. When you participate in the Rainbow Bridge Memorial Program, ACFA will send a condolence letter to your friend or relative in memory of their beloved feline. Your expression of compassion can be a very meaningful and comforting gesture to a grieving pet owner. Gift amounts are not disclosed but may be if the donor so wishes; however, gifts of $100 or more will be published on the Rainbow Bridge Honor Roll in the ACFA Bulletin. The donor will receive a lovely certificate of appreciation as thanks for the donation. 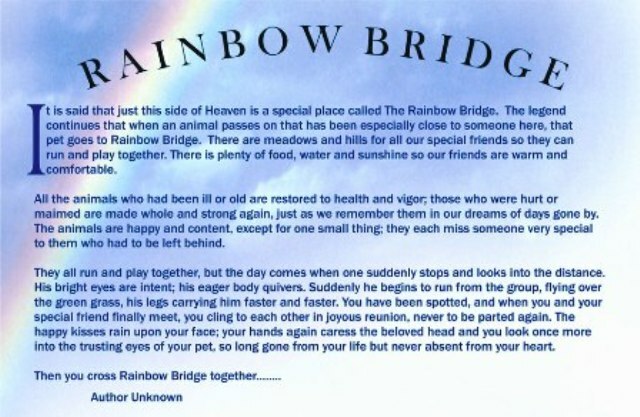 For gifts of $10 or more, a memorial can be placed on our Rainbow Bridge Memorials page on our Website. Furthermore, for an additional $10, a photo of the beloved pet can appear in our Parade of Royalty yearbook.